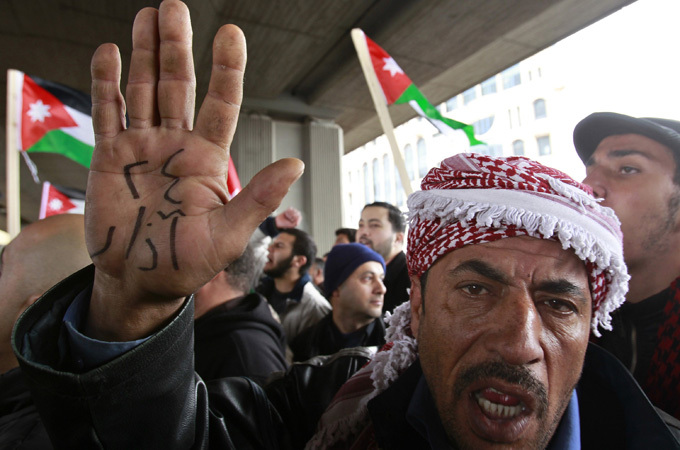 Hundreds of Jordanians set up a protest camp on Thursday in a main square in Amman to press demands for the ouster of the prime minister and wider public freedoms. Thousands of Syrians defied a crackdown by their government on Thursday to take to the streets in Deraa in funeral marches for protesters killed by police gunfire. Yemen’s opposition groups have dismissed President Ali Abdullah Saleh’s offer to stand down after a presidential election at the end of the year and are instead calling for mass demonstrations today with the intention of forcing the president’s immediate resignation. Relatives of at least 80 political prisoners on hunger strike held a demonstration in Cairo on Tuesday, accusing the government of holding them without charge. Truck drivers in the Gaza Strip began an indefinite strike on Tuesday to protest Israel’s closing of the Karni crossing, previously the main passage for goods into Gaza. University students in Las Vegas, Nevada staged the largest student protest in the state’s history on Tuesday over proposed cuts to higher education that could include laying off tenured faculty and declaring the equivalent of bankruptcy for the school. Citizens of Villa Park, California gathered outside a city council meeting on Wednesday to protest anti-Muslim remarks made by Councilwoman Deborah Pauly.